Probably the strangest of our raptors is the secretary bird, which (with its long legs) seems more like a stork or a crane than a bird of prey! 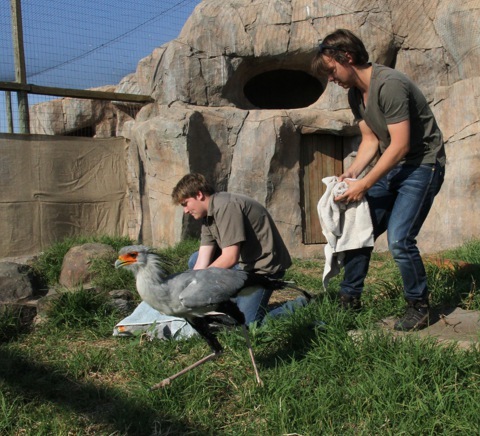 Volunteers Josh Klein and Kees Groot (in Africa for a month from the Netherlands) helped moved two non-releaseable birds from Raptor Rescue to a temporary enclosure behind Lesedi the Bearded Vulture. They are not yet on public display as they are still rather shy. Hessian sheeting is draped around the busier side of the enclosure to aid their transition, keep their stress levels down and help them get used to seeing people. The male is “Stix” a bird that has had a smashed pelvis due to a motor vehicle accident. He struggled a bit in the move and was stiff and limpy for a few days. His new girl-friend we’ve named Twiggy. She has only one eye, but the one that she’s got is beautiful with gorgeous long eyelashes!